Prepaid taxi, luxury cars are available at the airport to commute across the city. It will cost around INR 800 (Approximately 10 USD) from IGI Airport to Amity University sector 125, Noida. 1. Catch a Metro train from Airport Express Metro line at IGI Airport to New Delhi Metro station. Switch the metro to Yellow line towards Huda city centre. 2. Get off at the very next station Rajiv Chowk Metro station and change here from Yellow line to blue line towards Noida City Center. 3. Get off at Botanical Garden Metro Station. 4. From Botanical Garden Metro station take a auto rickshaw [Approx Fare INR 30 on shared basis] which will bring you at amity University sector 125. Indira Gandhi International Airport, New Delhi, India. International flights and some domestic flights arrive at Terminal 3 and Terminal 1. Prepaid taxi's, luxury cab's are available at the airport to commute across the city. The main railway stations are Old Delhi Railway Station, New Delhi Railway station. Other railway stations are Nizamuddin Railway station and Anand Vihar Railway Station which are closest to the venue of the conference. From all stations pre-paid three wheelers and taxi's are available. 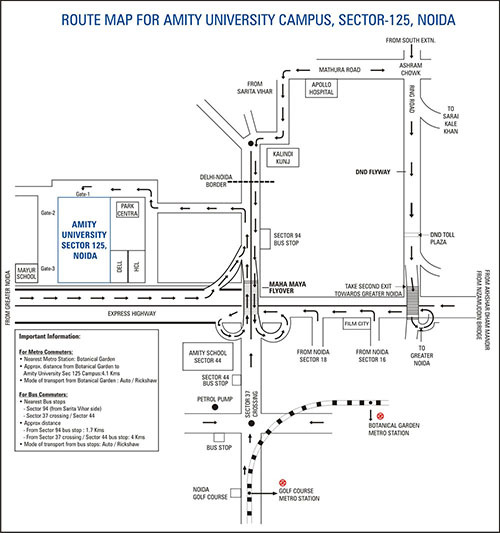 You can also reach Amity University campus via Delhi Metro Service, nearest metro station is Noida Botanical Garden (Auto can be taken onwards). Delhi Metro is available from Inter State Bus Terminal, Railway Station and Airport.